What Can Cause Cracks in Ceilings? While unattractive, cracks in your ceiling usually aren't a cause for alarm, unless they accompany other problems, such as blackened drywall or a known leak. If your ceilings are plastered, cracks are often attributable to weathering of the plaster. 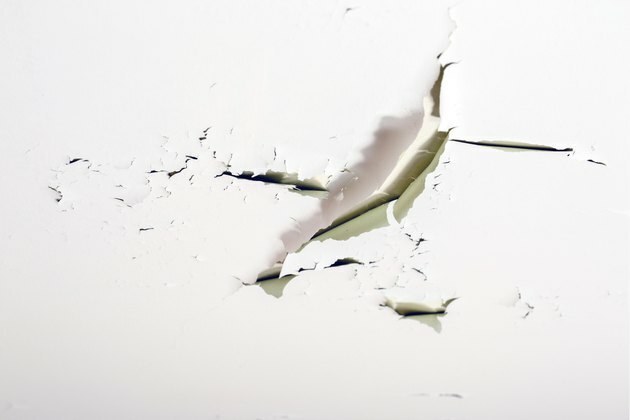 Cracks in drywall can be caused by truss uplift or vibrations from an appliance, such as a ceiling fan. In some cases, the cracks could indicate a serious problem that needs correction. If you live in an older home with lath-and-plaster ceilings, you can expect a certain amount of cracking to occur over the years. It happens because either the plaster shrinks or the lath to which it is attached moves with changing humidity conditions. As long as the cracks are less than 1/8 inch wide and extend no more than about 18 inches, they should not return after you patch them with drywall tape and joint compound. Seek professional evaluation if your ceiling contains many or wide cracks, or they have a stair- or V-shape to them. Such cracks can indicate structural problems. One of the most common causes of cracks in drywall ceilings is related to the roof trusses. These structural members sit on top of the wall plates and are often connected to the plates with nails. When the wood rafters expand and contract naturally with changing temperature and humidity, it pulls the ceiling joists away from the wall plates, forming cracks along the corners between the ceiling and the wall. You can correct this condition by replacing the nails with special ties that allow the joists to move, or you can simply cover the cracks with trim. Cracks that develop quickly may be warning you about a leak in an upstairs plumbing fixture or in the roof. If the leak is intermittent or slow, the drywall around the crack may discolor, because wet drywall is a favorite breeding ground for mold. The drywall itself may also be spongy, and it may sag. If you have a faster leak, dripping water may be pooling on the back side of the ceiling drywall, and if so, you cannot put off the repair. Wet drywall can crumble and fill the room below with soggy gypsum, water and soaked fiberglass insulation. Houses and foundations go through a settling period, especially during the first years after they were built. Expansion and contraction with hot and cold weather changes along with normal settling can change wall-to-ceiling alignment and can cause cracks in both these areas. Ceiling cracks generally follow the joints between drywall sheets, and as long as they remain minor -- with widths of less than 1/8 inch -- you can patch them with tape and joint compound. Prevent their recurrence by using fiberglass mesh drywall tape and setting-type joint compound to make rock-hard joints. What Would Cause a Vertical Crack in Drywall? What Causes Hairline Cracks in Walls? What Can I Do About the Ceiling Cracking Above the Shower?